Just a few links folks might find worth perusing. First, a few thoughts about President Trump's tax "plan:"
–I don't think it makes sense to discuss corporate or business taxation anymore without including pass-through businesses, which comprise most businesses and about half of business income. And Trump's plan opens up a fat, new loophole in this part of the code. –The criticism of the Trump tax outline–it's like 200 words!–has been both fulsome and pretty bipartisan. It's actually hard to find anyone who's not completely on the take to accept the administration's claim that the tax cut will pay for itself. –I've got one word for the tricklers: Kansas! On an unrelated topic–I mean, it's all related, but…–I posted this tweet the other day which is a followup on this earlier post re the 2017Q1 GDP release (the figure below should say "and" not "are"). 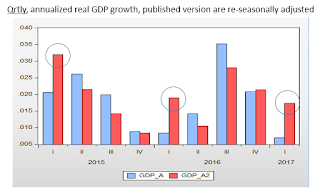 There's some evidence, including from BEA itself, that the seasonal adjustment procedures are not successfully extracting all the seasonality out of the non-adjusted data. So I just ran the SA data through the SA software again and got the results below. 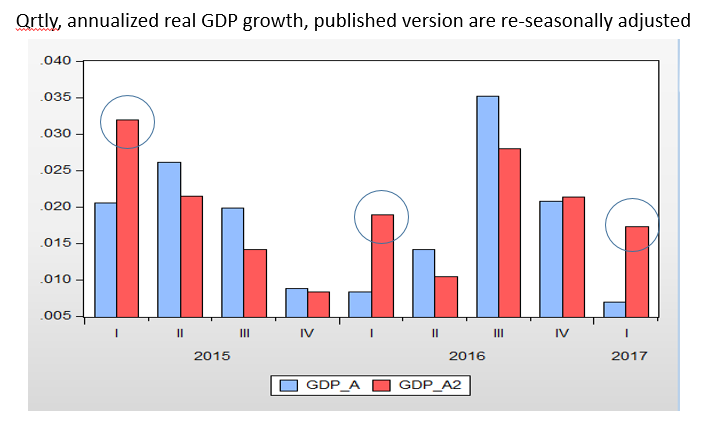 The readjusted Q1 real growth rates tend to be above the reported ones (which means other quarters must go the other way, since the annual change shouldn't be affected). If you're curious about this, and who isn't, here's a nice explainer of the problem and what BEA is doing to fix it.